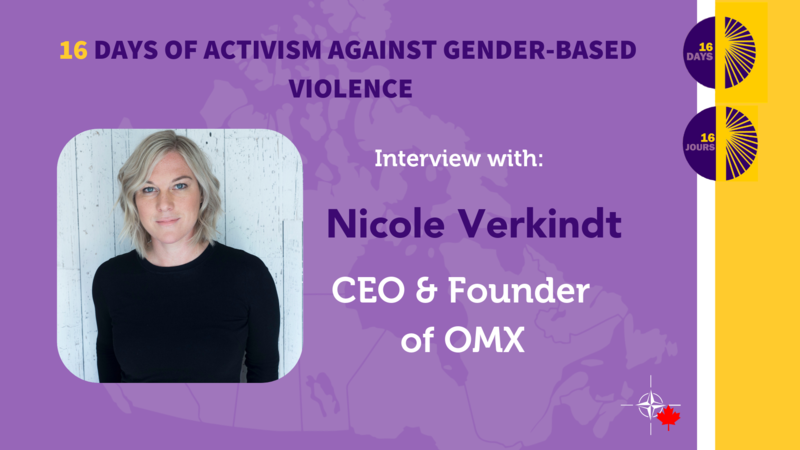 Nicole Verkindt is the founder and CEO of OMX, a collaborative platform for accessing procurement opportunities and analyzing the economic impact of organizations in the domestic and international defence, aerospace, oil & gas, mining, automotive and construction industries, and in other complex global supply chains. Nicole was named StartUp Canada’s 2017 Woman Entrepreneur of the Year, was a Dragon on CBC’s Next Gen Den, and was one of Adweek’s 2018 Brand Stars. She is also an investor on Gimlet Media’s “The Pitch” and commentator on CBC’s Tech panel. Nicole sits on the boards of Canadian Crown Corp: Canadian Commercial Corporation and the Canadian Chamber of Commerce. She is also a Next Gen member of the Canadian Business Council, which is made up of the CEOs of Canada’s top 100 businesses. Julia Schaumer, Program Editor for Women in Security at the NATO Association of Canada, sat down with Nicole Verkindt to get her opinion on the topic of women and leadership. Julia: What impact does an increased number of women in higher positions have on workplaces and society? Nicole: In order for organizations to remain competitive and stay relevant, they need to reflect all of their “user base” – customers and stakeholders. The more women we see in more senior leadership roles, the more competitive our economy will be and the more our non-profit/public sectors will better reflect their citizens. Organizations led by a diverse group of people are known to be much more effective, more open to change, more willing to embrace innovation and take risks and at the same time, are less risky as they take into consideration more opinions. Organizations need to avoid “Group Think” and by having women in senior roles as well as men, this will be a key driver to change this. We are living in an extremely fast paced world now, a world that is being transformed by technology overnight. We must have diverse leaders to lead us through the upcoming changes.